Shot Blasting | Rode Welding Inc. Rode Welding proudly offers steel shot blasting among our diverse custom fabrication services. 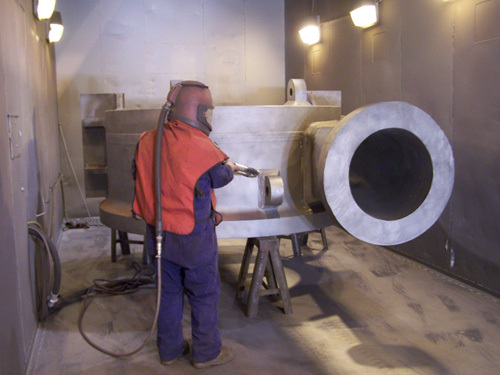 The shot blasting process is a treatment that uses abrasives to remove impurities from the surfaces of metals. Often utilized to prepare materials for other processes such as welding or powder coating, this treatment is used in a variety of industries including automotive, aerospace, foundry, mining, and ship building. Shot blasting, also known as grit blasting, is a method that falls under the larger umbrella of abrasive blasting surface treatments, of which sand blasting is another popular choice for OEMs and manufacturers. The biggest differences among abrasive blasting methods are the media and the application used to make the blast. 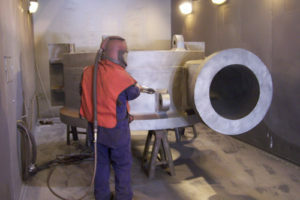 Sand blasting employs compressed air to repeatedly shoot silica sand out of a nozzle, while shot blasting uses the centrifugal force of a high speed turbine to accelerate shots of metal. The turbine wheel blades throw tiny metal balls directly onto the surface of the workpiece. These shots are then cleaned and recycled back into the throwing wheel to remove any dust, contaminants, or pre-existing coatings from the metal’s surface. The different types of media used in abrasive blasting have distinct shapes, hardness, sizes, and other properties that all affect the outcome of the surface finish. While shot blasting can work with shots of copper or aluminum, as a steel fabrication specialist, Rode Welding operates all of our shot blasting equipment with steel grit. This ensures that we can aggressively remove any contaminants from strong work metals such as steel. The facilities at Rode Welding contain a 15’ H x 12’ W x 22’ L shot blast booth to safely carry out the steel grit blasting procedure and remove metal impurities from the workpieces, often in conjunction with our other custom service offerings. In the booth, our highly trained and experienced operators stand outside the individual blasting components while using a foot pedal and gloved openings to manipulate them. Shot blasting is an eco-friendly process that recycles steel shots instead of wasting materials or turning to harsh and harmful chemicals. Not only does the shot blasting process completely remove impurities from the metal’s surface, but it also facilitates the formation of new bonds (from protective coating, welding, etc.) after the surface has been cleaned. Rode Welding has been shot blasting metals clean for over 65 years. We have the hands-on experience, the problem-solving mentality, and the proper equipment to get the job done. From the day you place your order to the day we deliver the final product, we will work with you to ensure that you receive the highest quality product, on-time, at a fair price. For more information about how our dedicated team can help you on your next shot blasting or custom steel fabrication project, contact Rode Welding today.